Without question, Van Coleman is one of the most respected talent evaluators in the recruiting world. In our latest premium offering, Van shares his thoughts on several key high school prospects with BDN's Mark Watson. Coleman joins a long list of national analysts that have shared their takes on the nation's best talent with Blue Devil Nation Premium, and as a member you will be sure to enjoy what he has to say about Jabari Parker, Semi Ojeleye, and several other Duke targets[private]. This past weekend's NBAPA Top 100 High School Camp in Charlottesville, VA was a different experience than in years past, and in many respects that was not a good thing. Media access was restricted significantly, quality one-on-one interviews were very tough to come by, and the whole atmosphere was a tad flat. Whether the reason was the coaches just failing to reach the kids, or the players themselves not bringing much energy, the result was some unusually uninspired basketball on a huge stage. After a lackluster start to the event, the kids finally put their games into gear on the final day. But the truth nevertheless is that more players hurt their ratings than helped themselves. Jabari Parker - His skill set makes him a man among children. He can pretty much do it all on the court; I saw no weaknesses in his game in the two games he [private] played. When he wanted to score, he put the ball on the floor and scored, utilizing a variety of driving moves to do so. Jabari was cordial and open with the media, but no matter what others claim, he did no one-on-one interviews, other than one national one. Michigan State has made a move on Parker, but Duke is still right there. My pal Van Coleman, who you will hear more from this week, said he understood Duke led for his services. Maybe they do, but I am not by any means ready to call Duke the clear leader here. A quick look at Duke's outstanding offers and the way they're recruiting certain positions suggests they may feel as I do. The Blue Devils certainly are a player for Parker, but in all honesty I do not feel as good about it as I did a year ago when I felt he was Duke's to lose. He will trim his list in July, and regardless, the Blue Devils will make that final cut. Al Freeman - When I first heard Duke had offered Freeman, I was stunned. I had watched him play at the Carolina Challenge and frankly, could not see it. I haven't changed my mind, or more accurately, his play hasn't changed it. Freeman is a good defender who gets after it at that end, but he is not a point guard and certainly not a shooting guard either. Dave Telep really overrated this kid early on, but he will drop in the rankings. Freeman is stuck in tweener land, and it hasn't helped him that his chemistry with Cat Barber for the Boo Williams AAU squad has been average at best. Nobody invited to an event like the NBAPA is a "bad" player of course, but in my opinion Freeman is just not a kid who can help at the level Duke plays. Freeman had so-so numbers this weekend, and did nothing to get anyone talking about him. But I do give him high marks for talking on the court and trying to pump his teammates up. I was unable to catch Freeman for an interview, but from all accounts little has changed beyond his recent decision to transfer to Findlay Prep in Las Vegas. Semi Ojeleye - As you already know, this kid is mature, bright and grounded. But can he play? Yes. As Andrew has mentioned, Semi has that ESPN-ready game, meaning he will launch the 3 pointer and also throw down the thunderous dunk. It is a bit freaky to see a 6'6" 220 pound player launch three point shots at this stage in his career, but Semi does it. But he needs to tighten his handle and go to work down low more. He is usually stronger than his opponent, so get down on the blocks more, already! Ojeleye is a good defender and had a lot of steals. His team made it to the finals, but lost to a team featuring 7'5" Mamadou Ndiaye. Ojeleye held his own guarding Ndiaye. 7'5"? That's insane. BTW, his first name is pronounced "Shimi," and we had a laugh at me wrecking his name a couple of times after asking about it. Talk about tongue tied. Ojeleye is a good team player and I would love to see him in a Duke uniform. Anthony Barber - This kid is quick off the dribble, gets to the rack fast, and finishes well. He's also stronger than he looks. But he looks for his shot first and said as much to me in our interview. He will project as a PG and in time will be fine there, but right now he is a shooting guard. He lets his dribble get too far away from his body at times, causing a lack of control, but this is easily missed by many observers who are in awe of his speed. I think he should be a better defender too. But again, he is a bit of a black hole, hunting his shot on every play, so it was not surprising that while Barber was the camp's top scorer, his assist totals were less than impressive. That may be the reason campers did not vote him to the All-Star game. Regardless, in my book he was a top 10 player at this camp, and most other analysts agreed. Barber will remain at or near the top of the list when talking guards in his class. There are some kids you can tell are enjoying the game and Barber is one of them. I like his game a whole lot, but I am not sure Duke likes it enough to offer. Parker Cartright - So, I started to hear that Cartright grew up a Duke fan, so I made sure to ask him about that, as you will see in an interview. Most everybody at the camp liked him, but he looks like a junior high baller in that he has a slight build and may be 5'9" on his tiptoes. The kid is unselfish and really involves his teammates in the action, and his speed can break a defense down. He's a pesky defender, but if a bigger player gets him on his hip, he has a hard time recovering. He is high energy and has the drive to get better, and those are two things all coaches look for in a prospect. Great kid to talk to and has offers from Arizona and UCLA, but he lit up when I asked him about Duke. Problem is Duke is in with so many PG types, and many analysts feel he will be tough to get off the west coast in any event. Cliff Alexander - I wanted to see where his head was and it is in the midwest. Duke will not waste its time unless something changes. He dominated at the camp and was clearly the best center there, keeping in mind that post play as a whole was not impressive in Charlottesville. Alexander has a mature body for his age and has the will to battle inside. Noah Vonleh - His game impressed me; his off-court demeanor did not. I hardly got anything out of him during a multiple site interview, meaning he plays it close to the vest and/or is not enthused. UNC is on him hard and Duke may get involved with this 2014 kid, but my impression from the interview is that it may be too late to get in deep here unless Duke increases its effort level soon. Wayne Selden - Wayne Selden is always consistent, but he did not stand out this weekend. Duke feels he will be a long shot and will likely stay on the sidelines on this one, but I like his game and his size. Kavon Looney - This was the first time I focused in on his game and I liked him a lot. The 2014 star can do a little bit of everything and he played well here, holding his own against older players, particularly on the boards. We tried, but never could manage to get together for a one-on-one. He is worth keeping an eye on. 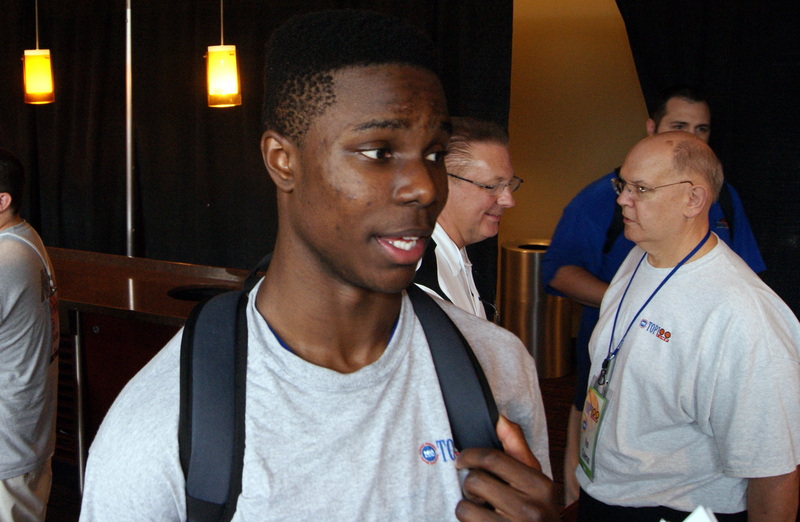 Others who caught my eye at the NBAPA Camp - Kuran Iverson, Andrew Harrison, Brannen Greene. Iverson appeared to be more motivated than when many last saw him, and he seemingly impressed everyone. Harrison is a complete player and was the better of the twin brothers on this weekend. Greene has improved leaps and bounds since the last time I saw him play. Rodney Hood - No, he was not there. But I got asked by everybody what I thought about his pending decision. Small world - So one writer who worked in Indy and is now with Rivals asked me about Hood. Turns out he wrote that controversial article on Coach K that appeared in the Indy paper during the FInal Four weekend when Duke defeated Butler. It was the article in which they acted as if a child used a crayon on the front page, drawing devil horns on Krzyzewski. It was tacky and unprofessional -- a true brain poot by anyone's standards. I then got the low-down and will only say he met with Duke officials per his paper's request. For our SID's privacy and others I will refrain from the details. He claimed he was awoken by a call from a friend, who asked, "What were you thinking?" He also claimed he knew nothing about it. When asked who did it, he claimed he didn't know. Yeah, right. How does it not come out who took it upon themselves to let the paper go out as it did before being yanked off the newsstands? Site shake ups - I saw Jerry Meyer in a 247 Camp and asked him when he went with them. As you know, 247 has courted us in a big way, but we chose to remain independent. Turns out Rivals let him and his big salary go, leaving Eric Bossi in charge along with the newly-hired Alex Kline, who uses smoke and mirror tactics better than anybody I know. Anyhow, I then learned ESPN shut down its High School division and that there was a major loss of jobs in the process. Trouble ahead for the NBA? - A power struggle is brewing with the NBA and you could feel the tension in many cases. I had an interesting conversation with Dave Wasserman and while I cannot share what was said, let's just say they will have a mess of legal issues once the Finals end. 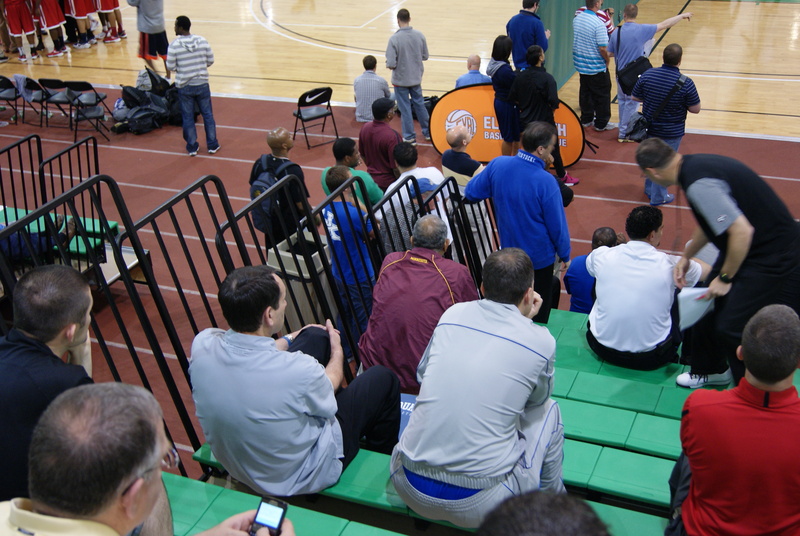 Day Two of the Nile EYBL Session II is in the books and it was a long one where the coaches were in the gym all day and night. It's hard to figure out where to start tonight in that my head is swimming from information overload. Let's start with Tyler Ennis who is still [private] on the radar and while he is listed as a PG, he shows off more shooting guard skills to me despite being just 6-3. I spoke with him after his game. And then there is Andrew Wiggins who if NBA rules allowed would go straight to the league. Of course Duke has interest but this will not be an easy get, so I would call that interest somewhat luke warm in that they know it would be quite the battle. I was impressed with Wayne Selden (2014) today and he's going to be a good one, I secured a video chat with him. 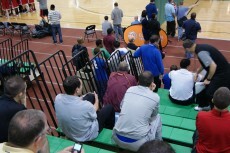 Duke has a lot of interest in him but it is too early for them to concentrate on that class which includes Theo Pinson. The interest is there for Pinson but they know he is a long ways from making his decision. Boo Williams continued their slide and will likely not make it to the Peach Jam or the EYBL finals, dropping to 2-7 with a loss to Mokan. Al Freeman has not been impressive in the event which I said from day one and I have yet to see him use his potential in a good way. When his offense struggles he allows it to effect his whole game and while he had a good game tonight shooting the ball, his other stat totals were again, non existent. I don't think Boo uses him right. Anthony Barber is good, but not good enough to earn an offer at this point. He is a PG that cannot really pass that well and the chemistry with Freeman ia average at best. And Try Williams continues to regress with many questioning his work ethic. Julius Randle improved his stock and that is hard to do when you are ranked 2nd in your class. His handle is nice for a big man and he dominated when he did take it to the paint. He told BDN he had so many triple teams he decided to take his game to the perimeter and it seems to be working. Yes Matt Jones is better and he told BDN he is now 6-5 but the same weight. I have vid interviews with both. I spoke with ex ACC official Larry Rose for a good long time and what a chat we had. He is head of MEAC officials now. I laughed at him being ragged in Cameron back in the day. Semilore Ojeleye. Semi is pronounced Shimi. I sat with Coach for part of his game and he like him a lot as do the assistants. I was tipped off they thought he could be offer material on Friday and had a brief chat with him on video. Great kid. His game? Nice. Great stroke from 3, solid, strong finisher on dunks. Listed at 6-7, but said he is 6-6. And guess who he pulled for when he grew up but don't they all;(. Anyhow, love his game and want him in royal blue. Unique player with incredible background, smart, solid student -- the whole package. Ish Wainright is a defender supreme who can guard almost anyone and wants all challenges. Coach wants to see more offense from him. He was a beast tonight and hit a three point shot at the buzzer and Team Takeover finally won and that meant we got to talk to him, yay. Yes, that was sarcasm in that his coaches are a trip an then some. Coach was upset about the injury to Derrick Rose and spoke of the challenges in filling the Team USA roster. Of course. Dwight Howard is out too but all the studs are expected to play. He's been on the road non stop and came in late from Arkansas where he saw Austin Nichols score 35 points, grab 15 rebounds and swat 7 shots away in a single game. Yeah, he's good. The Duke Basketball program puts out a lot of feelers and they are currently evaluating a lot of players. 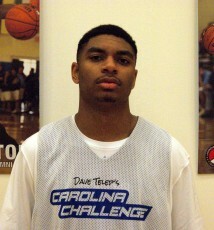 Al Freeman (6-4 SG, Olympic HS in Charlotte, N.C.) is one of the highest rated guards in the class of 2013 and he said his coach recently heard from Duke Assistant Coach Chris Collins, UCLA and Ohio State. 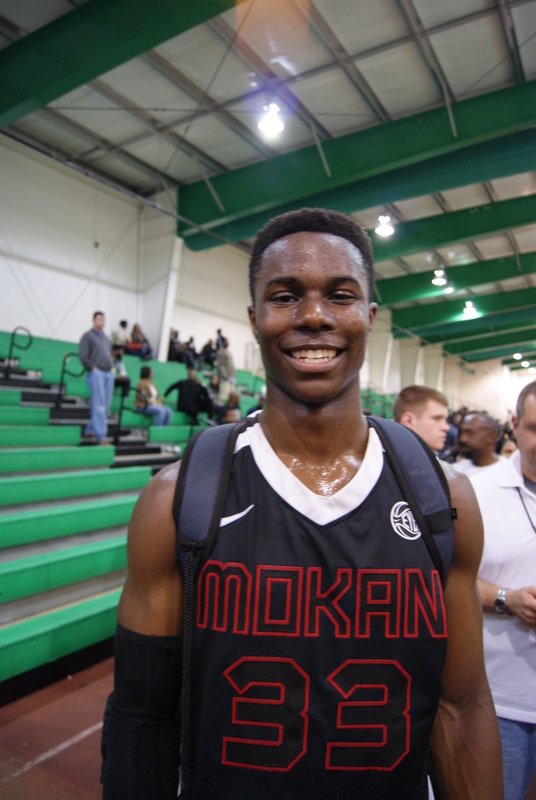 He recently trimmed his list to Kansas and Villanova but said he would still entertaina school that is the right fit. 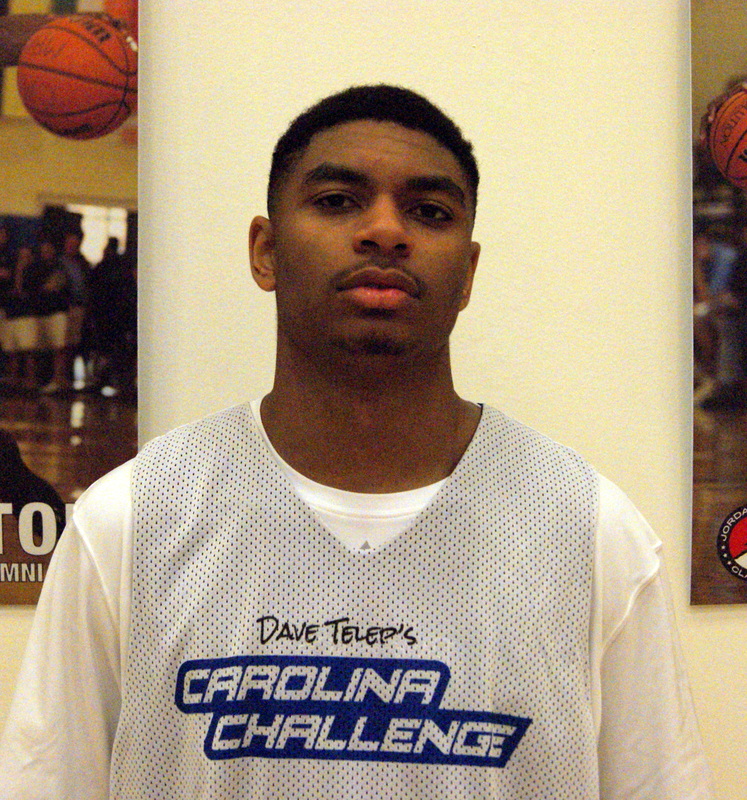 Freeman scored but a single point in his opening game which caused one veteran analyst to say he was the most disappointing player he viewed in the morning session, but he bounced back with 19 in the next game and averaged 9.0 during the Carolina Challenge event which features the top players in the state of North Carolina. BDN Premium caught up with Freeman and got his thoughts on the process. How are you liking the camp thus far? I love this camp, it's my third year here. I got here a little late but just went right in and played in the first game. If somebody had yet to see you play, how would you describe your game to them if asked? A big combo guard who looks for his shots as well as teammates and loves to win. Do you pattern your game or try to emulate [private] anybody on the court? What is going on with you and the recruiting process or where do you stand at this time? I cut it down to Villanova and Kansas. Is that the only two schools that have come in or that you have settled on? Ohio State and UCLA jumped in and Duke is starting to show interest. Collins expressed interest to my AAU coach. Do you have any interest in Duke? Yeah, I have interest in Duke. Villanova develops players and their guards specifically, they have a great coaching staff that really cares about their players. The same goes from Kansas and they get guys to buy into what they do. Just a program that allows their guards to be guards. I don't want to go to a program that makes you a one or two guard. So are you willing to let other schools in? Uhm, only if it's the right fit. With a program coming in a little late like say Duke, does that have a negative effect? Naw, everybody has their way of recruiting, each school handles it differently. Will you take all of your allotted official visits? I don't know yet, it's hard to say. Is their a timeline for a decision? Thanks for your time and good luck with the process.